The Mini-tau is an ultra-compact, low cost, filter-based fluorescence lifetime spectrometer for lifetimes ranging from 25 ps to 50 μs*. 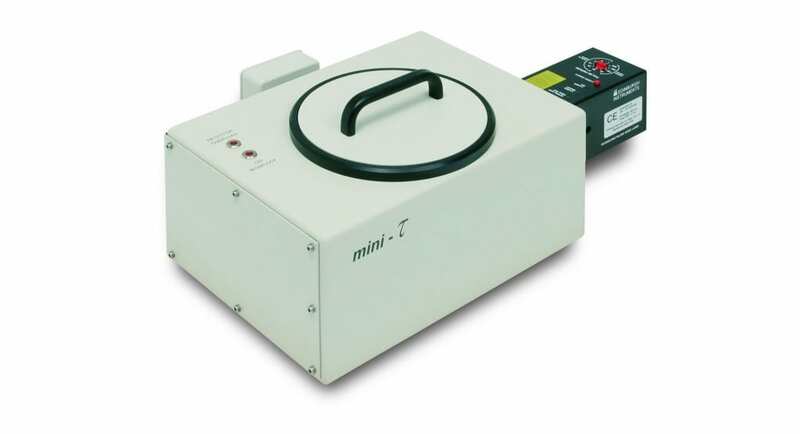 Using the Time-Correlated Single Photon Counting (TCSPC) technique, the Mini-tau is supplied with our F980 software and a USB connected TCC2 electronics module to enable fast, reliable, and accurate measurement and data analysis. Whether you need to measure fluorescence lifetimes of time-resolved fluorescence anisotropy for research, quality assurance or teaching applications, the Mini-tau is the ideal all-inclusive, fully-integrated solution. The Mini-tau measures fluorescence lifetimes after numerical reconvolution based on the established Marquardt-Levenberg algorithm. The F980 software supplied with the Mini-tau has an easy-to-use interface and allows users to comprehensively record data and accurately analyse complex decay kinetics of up to 4 lifetimes. *Minimal lifetime resolution is laser dependent. Filter Wheel Comes as standard to accept 50 mm x 50 mm filters. Filter wheel with 5 bandpass filters of approx. 50nm width centred at 450nm, 500nm, 550nm, 600nm, and 650nm; one position without filter. Front-Face Sample Holder: Single position front-face sample holder. This sample holder is suitable for measuring front-face emission on cuvettes. Two additional inserts are supplied. Insert for holding films/slides, and insert comprising demountable cuvette. Standard Range (220 nm – 900 nm): Glan Thompson polarising prism. Spectral range 220 nm – 900 nm. The polariser can be manually moved into or out of the beam. The position is recognised by the computer. When in the beam, the polarisation angle is fully computer controlled. Anisotropy measurements are possible if both excitation and emission polarisers are present.